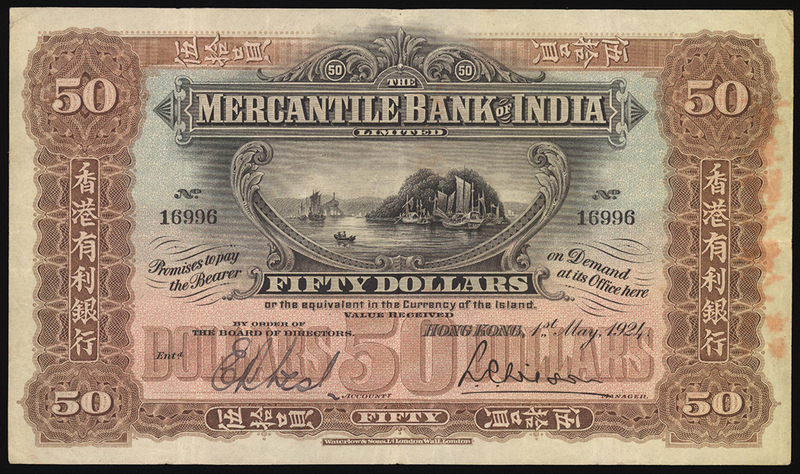 The Mercantile Bank of India, $50, 1.5.1924, serial number 16996, black on brown, blue and light pink, vignette of sampans and junk boats at top centre, 50 at each corner, with an ornate border at left and right, a clear handsigned signature at bottom left, reverse black and brown, Mercury with a winged helmet at centre,(Pick 238), original solid very fine. No repairs, no holes and no tears. A single line of chopmarks stating Hong Kong Sheung Wan Tai Fook Goldsmiths on the reverse. Extremely rare in any form and especially in its natural condition and virutally no problems. A visually attractive note and missing even in the most advanced collections. The cataloguer cannot recall any instance this note was offered in a public auction within the last 20 years. A once in a generation opportunity.